At Harvard University, two men debate the merits of invading forces, and how even though bad things happen good things can come from it (like roads and civilization coming out of Ancient Rome). One of them thinks superheroes fighting off alien invasions is stopping the next great progress that could cure disease or end famine. In Metropolis, Lois meets with Catherine Devereux from Cadmus, who seems to want to share some information about a project she was working on. Kara saves someone falling off a building, who did it so she would catch him and he could ask for her phone number. Back at Harvard, one of the guys (students?) has made an application called Flyover, for tracking superhero sightings that works like FourSquare (people see a hero, check in on the program and earn points, and can then upload photos and videos of the heroes). Turns out the guy Kara saved and who wanted her number uploaded a photo of her to that very service, and then some sort of portal opens up where Kara is and Parasite, Kryptonite Man, Silver Banshee and Metallo step through. Kara asks who hired them, and Kryptonite Man says they want to kill her for free. Catherine gives Lois a file folder with all the information on what Cadmus is doing, and Lois seems horrified by it. Kara fights the villains (with a really bad one-liner) and feels something isn't right. In the Daily Planet, Perry White wants some local news, when Lois busts in and shouts about Cadmus experimenting with Kryptonian DNA. Meanwhile the guy behind the superhero tracking program is revealed to be Alex, who has a way of "getting inside your head". Kara's battle continues, Catherine goes home looking for her sick son, and Alex has stolen the girlfriend of one of his friends. Alex thinks superheros are a threat to humanity, and Supergirl is more of a threat than Superman because she's the future. One of his friends thinks he's talking about killing Supergirl, and he says he's thinking bigger. He then reveals that he knows intimate details about all of his friends and uses it to blackmail them into silence. Catherine finds her son, presumably dead, and there's a note from Alex that says "It's not nice to talk out of class. Sorry for your loss." Story - 4: There are only a few things keeping this back from a 5. Kara's one-liner about "don't ask, don't tell" was groan-inducing and brought down what was otherwise a general step up in the dialogue department for this book. More than that, though, the real problem is Alex. I actually kind of love his scheme of tracking heroes, so he knows where they all are at all times. It's rather ingenious, passed off as a fun and benign phone application. But I don't understand why he even needs it when it seems he can easily manipulate people and/or even read their minds. If he wants to know where Supergirl is, can't he just use his mind powers (or whatever they are) to find out? It seems pretty clear all the villains she's fighting are apparitions somehow caused by Alex, and it seems like someone with that kind of power and ability wouldn't need a phone app to find people. And then there's the whole issue of him revealing (most of) his nefarious plot to his unsuspecting "friends" and then blackmailing them into not saying anything to anyone about it. Why on earth would he do that? Why would he explain his actions to a group of people he clearly finds absolutely beneath him in every way? It's very "muahahaha I'm evil" old-school villainy, but in such a modern story it comes off hokey, trite and pointless (or just paints him as extraordinarily stupid, when everything else in the book paints him as extraordinarily bright). That was the only thing that bothered me, though. As for the rest, I'm on board and ready to see where it's going. Art - 3: This is really hit and miss for me. Lois looks great in pretty much every panel she's in, but Supergirl... not so much. The first time we see Kara in the big splash she looks great (although so skinny I wonder where some of her organs and bones got to), but then look at her face on the bottom right of page 6 and it's just... yow. She doesn't even look like the same person from the splash page, and actually kind of looks like a drugged-out Paris Hilton. By contrast, the tall vertical panel directly to the left of the Paris-face, on page 6, is wonderful. 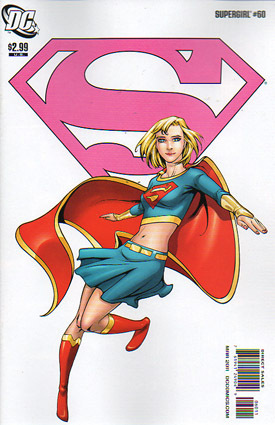 Hopefully we'll see a little more consistency in the future, and a little room for Kara (and all females in the book, really) to have organs and not look like emaciated supermodels. Cover Art - 2: I am not digging on this at all. Kara looks 12 again, which is a big pet peeve of mine, and I'm left wondering if it's Plastic Man in disguise by the rubbery left foot she's got going on. In fact, looking at it again, her entire body looks rubbery and like she's being stretched in weird directions.